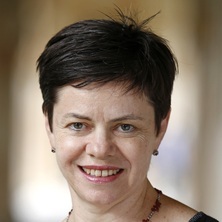 Professor Joanne Tompkins is currently seconded to the Australian Research Council as Executive Director of the Humanities and Creative Arts panel, for a period of three years (until 2019). Her research interests include spatial theories and virtual reality; post-colonial, intercultural, and multicultural drama, literature, and theory; performance theories; and feminist performance. Her current research includes 3D visualisation and modelling of theatre spaces; the spatial theory of heterotopia; space in Australian and Canadian theatre; database of Australian performance; multicultural theories and drama, and intercultural performance. She is author of: Theatre’s Heterotopias: Space and the Analysis of Performance. Basingstoke: Palgrave Macmillan, 2014; and Unsettling Space: Contestations in Contemporary Australian Theatre. Basingstoke: Palgrave/Macmillan, 2006. She is co-author of: A Global Doll's House: Ibsen and Distant Visions. London: Palgrave Macmillan, 2016 (with Julie Holledge, Frode Helland and Jonathan Bollen); Women's Intercultural Performance, Routledge, 2000 (with Julie Holledge); and Post-colonial Drama: Theory, Practice, Politics, Routledge, 1996 (with Helen Gilbert). She is editor of: Theatre Journal, "Space and the Geographics of Theatre," a special issue of Modern Drama, 2004; "Theatre and the Canadian Imaginary," a special issue of Australasian Drama Studies, 1996. She is co-editor of: Performing Site-Specific Theatre: Politics, Place, Practice, Palgrave Macmillan, 2012 (with Anna Birch); Site-Specificity and Mobility, a Special Issue of Contemporary Theatre Review 2012 (with Anna Birch); Performance and Design, a special issue of Australasian Drama Studies (with Andrew Filmer and Miranda Heckenberg) 2012;Modern Drama: Defining the Field, University of Toronto Press, 2003 (with Ric Knowles and WB Worthen); Modern Drama 1999-2005; Performing Women / Performing Feminisms: Interviews with International Women Playwrights (with Julie Holledge). I am interested in the creation and manipulation of imaginative space/locations on stage, and the ways in which architecture contributes to imaginative stage space. I am also interested in the relationship between space on stage and space in the cultural context outside a theatre venue. I describe this through the concept of heterotopia, a development of Kevin Hetherington's formulation of Foucault's version of the term. I research the ways in which theatre might engage with virtual reality. I explore this primarily through the redevelopment of historical theatre venues, virtually. These venues are useful to explore architectural structure, how special effects worked, how actors moved and performed on such stages, and how stage properties functioned then. Professor Tompkins has made a research impact in terms of the development of cultural spaces for theatres, galleries, and museums. Through the Ortelia project (www.ortelia.com), she, in conjunction with two Virtual Reality modellers, has developed tools for managing contemporary cultural venues. There is also the capacity for curating and archiving gallery and museum exhibitions and designing theatre productions. There is also a historical component to the theatre projects: this aspect of Ortelia models early modern theatres from London to investigate how performance was staged then. Ortelia has also developed the capacity to provide the curation of 3D mobile objects for museum exhibitions and for greater investigation by the museum community and by the cultural community from which the objects have emerged. She is the recipient of an Honorary Doctorate from Queen Mary, University of London (2015). "Being With:" Establishing Co-presence Between Multimedia Images and Performers in Multimedia Performance. Among the topics I could supervise are theatre history, theatre theory, and cultural, national, spatial approaches to theatre. I am particularly interested in Australian and Canadian theatre. I am interested in topics relating to digital humanities and theatre and VR theatre. Performing site-specific theatre: politics, place, practice. Edited by Anna Birch and Joanne Tompkins Hampshire, U. K.: Palgrave Macmillan, 2012. Modern Drama: Defining the Field. Edited by R. Knowles, J. E. Tompkins and W. B. Worthen Toronto, Ontario, Canada: University of Toronto Press, 2003. Holledge, J. and Tompkins, J. E. Women's Intercultural Performance. London: Routledge, 2000. Tompkins, Joanne (2013). Noëlle Janaczewska’s twenty-first-century theatre: explorations of Australian cultural constructs and theatrical form. In Richard Fotheringham and James Smith (Ed. ), Catching Australian theatre in the 2000s (pp. 207-220) Amsterdam, Netherlands: Rodopi. Delbridge, Matthew and Tompkins, Joanne (2012). Reproduction, mediation, and experience : virtual reality, motion capture and early modern theatre. In SPACE–EVENT–AGENCY–EXPERIENCE: open access epublication of the DREX Project Centre for Practice as Research in Theatre (pp. 56-65) Tampere, Finland: University of Tampere. Tompkins, Joanne (2010). Balancing the 'Local' and the 'Global' in theatre for the international stage: The stage adaptation of David Malouf's Johnno. In Pirkko Koski and Melissa Sihra (Ed. ), The local meets the global in performance (pp. 81-98) Newcastle upon Tyne: Cambridge Scholars Publishing. Tompkins, Joanne (2010). Spatiality and contaminated land: Staging Maralinga. In Jennifer Rutherford and Barbara Holloway (Ed. ), Halfway house the poetics of Australian spaces (pp. 310-319) Crawley, W.A., Australia: UWA. Harvey, Neal, Grehan, Helena and Tompkins, Joanne (2009). AusStage: From database of performing arts to a performing database of the arts. In Katherine Bode and Robert Dixon (Ed. ), Resourceful reading: The new empiricism, eResearch and Australian literary culture (pp. 325-333) Sydney, Australia: Sydney University Press. Tompkins, Joanne (2009). Staging the imagined city in Australian theatre. In D. J. Hopkins, Shelley Orr and Kim Solga (Ed. ), Performance and the city (pp. 187-203) UK: Palgrave Macmillan. Tompkins, Joanne (2008). Landscapes and Soundscapes in Noelle Janaczewska's Theatre. In Noelle Janaczewska (Ed. ), Songket; This territory/two plays by Noëlle Janaczewska (pp. ix-xiv) Strawberry Hills, Sydney, N.S.W: Currency Press. Tompkins, Joanne (2007). Performing history's unsettlement. In J. Reinelt and J. Roach (Ed. ), Critical theory and performance 2nd ed. (pp. 71-84) Ann Arbor, Michigan, U.S.A.: The University of Michigan Press. Tompkins, J. E. (2006). Counter-monumentalising and Janis Balodis's The Ghost Trilogy. In McAuley, Gay (Ed. ), Unstable Ground: Performance and the Politics of Place (pp. 81-93) Berlin: P.I.E. Peter Lang. Tompkins, Joanne (2006). Gendering space: The desert and the psyche in contemporary Australian theatre. In Elaine Aston and Geraldine Harris (Ed. ), Feminist Futures? Theatre, Performance, Theory (pp. 190-208) New York, N.Y, United States: Palgrave Macmillan. Tompkins, Joanne (2006). The Shape of a Life: Constructing the ‘Self’ and ‘Other’ in Joan MacLeod’s The Shape of a Girl and Guillermo Verdecchia and Marcus Youssef’s A Line in the Sand. In Sherrill Grace and Jerry Wasserman (Ed. ), Theatre and autobiography: Writing and Performing Lives in Theory and Practice (pp. 124-136) Penticton, British Columbia: Talonbooks. Harvey, N. A. and Tompkins, J. E. (2006). Virtual reality and negotiating problems of real theater space. In T. Rommel and M. Schreiber (Ed. ), Mapping Uncertain Territories: Space and Place in Contemporary Theater and Drama (pp. 169-178) Germany: Wissenschaftlicher Verlag Trier. Tompkins, Joanne (2003). Yellow Fever, Yellow Claw, Yellow Peril: Performing the Fantasy of the. In Grace, Sherrill and Glaap, Albert-Reiner (Ed. ), Performing National Identities: International Perspectives on Contemporary Canadian Theatre (pp. 289-302) Vancouver, Canada: Talonbooks. Tompkins, J. E. (2001). "Fatherlands and Mother-tongues": Family Histories and Futures in Recent Australian and Canadian Multicultural Theatre. In M. Maufort and F. Bellarsi (Ed. ), Siting the Other (pp. 347-362) Brussels: P.I.E.-Peter Lang. National Performance: Representing Quebec from Expo 67 to Celine Dion. By Erin Hurley. Ros Merkin, ed. "Liverpool Playhouse: A Theatre and Its City"
Tomkins, Joanne (2010) The politics of locating Othello in Finland. Nordic Theatre Studies, 22 20-29. Tompkins, Joanne (2009) Urban entanglements in three African Canadian plays: Lorena Gale's Angelique, George Boyd's Consecrated Ground, and Andrew Moodie's Riot. Theatre Research in Canada, 30 1-2: 17-36. Tompkins, Joanne (2008) Adapting Australian novels for the stage: La Boite Theatre's versions of Last Drinks, Perfect Skin, and Johnno. Australian Literary Studies, 23 3: 305-317. Tompkins, Joanne (2007) Review: Staging social welfare. Canadian Literature: A Quarterly of Criticism and Review, 193: 112-115. Tompkins, J. E. (2006) Remember the nation: Lorena Gale's Je me souviens. Canadian Theatre Review, 125 56-61. Tompkins, J. E. (2004) Directing and producing theatre with the help of virtual reality. Scenography International, 7: 1-5. Tompkins, J. E. (2004) Review: The semiotics of theatre and drama, second edition by Keir Elam. Australasian Drama Studies, 44 146-148. Tompkins, Joanne (2003) Canadian Theatre and Memorializing: Memorializing and counter-memorializing in The Death of General Wolfe, Angélique and Sled. Canadian Theatre Review, 115: 5-11. Tompkins, J. (2003) Space and the geographies of theatre: Introduction. Modern Drama, 46 4: 537-541. Tompkins, Joanne E. (2002) Review of the Haunted Stage: The Theatre as Memory Machine. Etudes Théatrales/Essays in Theatre, 20 2: 157-158. Peter Dickinson, Here Is Queer: Nationalisms, Sexualities, and the Literatures of Canada. Toronto: University of Toronto Press, 1999. Tompkins, Joanne (2001) Peter Dickinson, Here Is Queer: Nationalisms, Sexualities, and the Literatures of Canada. Toronto: University of Toronto Press, 1999.. AUMLA, 95: 126-127. Tompkins, J (2001) 'Homescapes' and identity reformations in Australian multicultural drama. Theatre Research International, 26 1: 47-59. Tompkins, J. E. (2001) Modern: Drama (defining the field), Part II. Modern Drama, 44 1: 1-2. Tompkins, J. E. (2001) Teaching Canadian Plays in Australia. Canadian Theatre Review, 105 Winter: 27-28. Tompkins, J. E. (2000) The Drama of South Africa, by Loren Kruger. Australasian Drama Studies, 37 October: 124-126. Tompkins, J. E. (1999) Review of Humphrey Bower, Adaptor, Natural Life. Australasian Drama Studies, 35 October: 186-189. Tompkins, Joanne (2011). The use of virtual reality models in capturing the spatiality of early modern venues. In: 9th World Shakespeare Congress 2011, Prague, Czech Republic, (). 17-22 July, 2011. Tompkins, Joanne and Erskine, Shona (2009). BoF: AusStage and the Aus-e-Stage Project: Collaborative eResearch in the performing arts. In: eResearch Australasia 2009, Sydney, Australia, (). 9 - 13 November, 2009. Tompkins, Joanne and Delbridge, Matt (2009). Using virtual reality modelling in cultural management, archiving and research. In: Alan Seal, Suzanne Keene and Jonathan Bowen, Proceedings of EVA London 2009. EVA 2009 London Conference, London, UK, (260-269). 6-8 July 2009. Tompkins, Joanne (2009). Virtual recreations of historical theatres: How VR meets theatre history. In: eResearch Australasia 2009, Sydney, Australia, (). 9 - 13 November 2009. Unstable Spaces: Traces of Maralinga, Nuclear Fallout, and Contamination in Contemporary Australian Theatre. THE KINESTHETICS OF ROCK MUSIC PERFORMANCE: AN EXAMINATION THROUGH PERFORMATIVITY, MASCULINITY, AND NICK CAVE.